Insurance is an intangible service to consumers, where they essentially are buying security and peace of mind. Insurance protects them against unexpected damage of their motor vehicle and financial loss. It is not a product that consumers actively seek out – they just know that they should have it, and in some jurisdictions certain types of car insurance are mandatory. Insurance is one of those products where the majority of consumers are less involved in the purchase decision (primarily due to lack of interest) and, as a result, consumer typically sees very little differentiation between competitive offers. This will mean that price and brand and distribution channel will play a more important role in the successful sale of insurance products, as opposed to the quality and design of the product itself. This market segment of consumers is highly risk adverse and tends to be “heavy users” of insurance. They will tend to ensure all their assets, such as house and car, as well as take out life insurance and income insurance. This gives them tremendous peace of mind and financial security. They were tend to be, but not always, higher income earners who see themselves as financially savvy, and do not understand why some people do not have insurance. They are more involved in the purchase decision than the other market segments and tend to review the product details and compare products on that basis. Price is not a major consideration in their purchase decision and they will generally take out large amounts of insurance cover. This market segment is also quite risk adverse, but do not have the extent or the volume of insurance that the fully covered segment has. Instead, they view brand loyalty (that is, being a long-term customer of one insurance company) as something that gives them more security. They believe that their future insurance claims are more likely to be paid if they have a significant history with the one insurance company. This segment becomes the core customer base for higher branded insurance companies, as these customers are also attracted to well-known and reputable insurance firms. As a result, they are highly unlikely to switch, and are quite price insensitive. A strong brand and a long-term relationship are the key benefits of they seek in the insurance market. Price shoppers perceive very little difference between competitive offerings of insurance and will make their decision on a price basis. They see no benefit in loyalty and have the perception that insurance companies are more generous to new customers than to existing customers. It is not uncommon for this segment of consumers to shop around every year for insurance and even switch back and forth between insurance companies over time. These are convenience motivated consumers. They know they need insurance, but see it as a hassle to fill out forms and paperwork. They are attracted by offers of quick and easy insurance or may deal through a third party agent. They are quite likely to have all their insurance with the one firm. They are not concerned with price or the product details, or even who their insurance is with. Perhaps not surprisingly, this market segment is generally quite profitable (once they have been acquired by an insurance firm), as they are very loyal, price insensitive, and less likely to make an insurance claim. 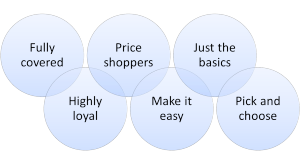 This market segment of consumers has a perception that you just need basic cover. They see themselves as smart shoppers and not needing to pay for “fancy” extra pieces of cover that they will probably never use. In many ways, they are like the consumer in a supermarket, who sees themselves as a “smart shopper” and generally gets a better deal than other people. 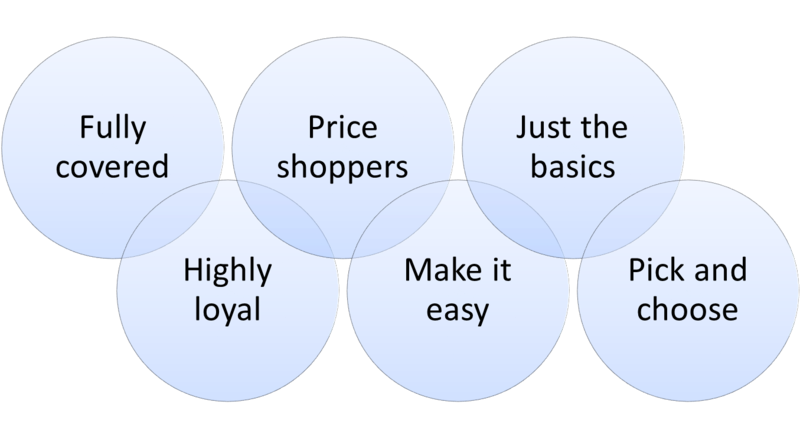 Therefore, they are not necessarily price shoppers, but will make decisions more a rational price-value basis. This first market segment within the car insurance market is attracted to insurance products that offer flexibility and the ability to add and subtract components of the insurance cover. They have a good understanding of their insurance needs and are reasonably involved in the purchase decision. They differ from just the basics market segment in that they will seek out specific levels of additional coverage for their particular situation. They expect some form of discount for not being fully covered, so price is somewhat important to them.